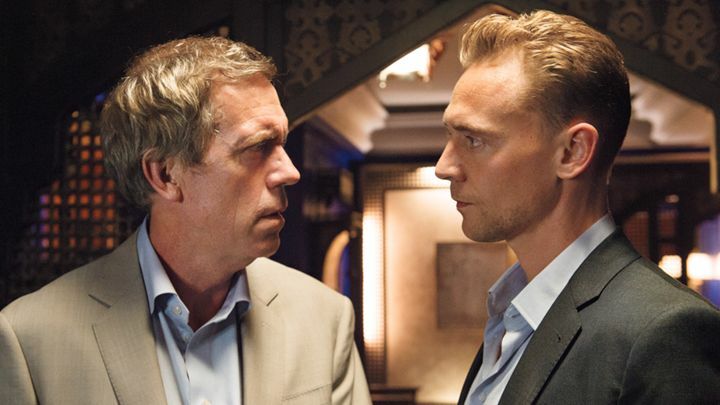 I generally find John Le Carre film and television adaptations to be hit and miss, but in The Night Manager the world might just have been presented with the best Le Carre adaptation yet. 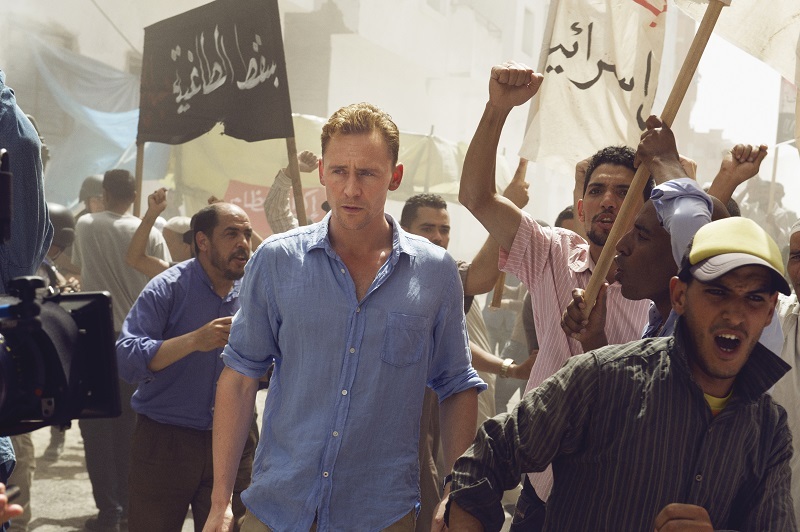 The six part miniseries is the story of former British soldier, Jonathan Pine (Tom Hiddleston), working as the night manager for a luxury hotel in Cairo. While the riots of the 2011 Egyptian Revolution threaten the streets outside the hotel, Pine soon becomes involved with guest Sophie Alekan (Aure Atika), the mistress of the wealthy but corrupt Hamid family that owns most of Cairo. Sophie asks Pine to securely store copies of confidential documents that connect Hamid with a notorious and ruthless arms dealer, Richard Onslow Roper (Hugh Laurie). It seems the two men are transacting significant military hardware and illegal chemical weapons for a huge dollar sum. Led by his conscience, Jonathon hands over the documents Britain’s International Enforcement Agency (IEA), a government organisation tasked with limiting the impacts of illegal arms trade across the global. However, through corrupt connections in the British government, the Hamid’s are informed of Sophie’s betrayal, and she is quickly murdered. Five years later Pine is still devastated by Sophie’s murder, only now he is the night manager in another luxury hotel in Switzerland. One night new guests arrive, none other than Roper himself, accompanied by his girlfriend Jed Marshall (Elizabeth Debicki) and his business associate Lance Corkoran (Tom Hollander). Pine uncovers further incriminating files on Roper, and again passes the information onto the International Enforcement Agency . Soon after, intelligence operative Angela Burr (Olivia Colman) of the IEA, sensing Pine’s drive to take down Roper, recruits Pine and provides him with a deep cover to infiltrate the arms dealer’s organisation. Pine’s objective is to expose Roper and shut him down, not an easy task for Roper is very careful with everything he does. Needless to say, the series creates a lot of tension through the deceits and double plays from every significant character. Tom Hiddleston’s Pine is well crafted – it is easy to observer how careful he is at building a deep cover and sticking with it, even when it would be simple enough for him to cut corners. The man comes across as a professional when so many movie and television spies look amateurish. His actions make him real. Pine’s weakness of course is Jed Marshall, because the two soon fall for each other. Intimacy is perilous for both their lives. Normally such a relationship would come across as cliqued, but both Pine and Jed have well-crafted backstories, so their attraction feels real. The action moves through Europe and North Africa with as many exotic locations as you would find in a James Bond movie. The cinematography really gives a sense of the exoticness of each location, from Egypt to Turkey, Syria, England, Switzerland and Spain. The war zone locations on the Syrian-Turkish border had a great sense of authenticity to them. Hugh Laurie, as always, is brilliant as the cultured upper-class British but very sociopathic arms dealer, but all the actors are well cast and portray their individual roles with skill. Credit also needs to go to Susanne Bier, a Danish director in her first English language production, and the script from David Farr. This is a great series, well worth the effort, and certainly the best Le Carre adaptation since The Constant Gardner. Thanks for your comment Ifan.